Fatal accident at Blackwood. Inquest on the bodies of two men who died at the True Blue Mine, Barrys Reef 1870. An interesting record was found in the Ballarat Courier newspaper on TROVE. Two young miners were found dead in the True Blue Mine in Barrys Reef, Blackwood. As in those days an inquest was held at a Hotel where the bodies were held below the hotel in the cellar, often in hurriedly constructed coffins, which in this case was the Williams’ Exchange Hotel, Barrys Reef. In consequence of the non-arrival of the coroner, E. Baber, Esq., .J.P., held a magisterial enquiry at Williams’ Exchange Hotel, Barrys Reef, touching the death of Louis Schinkle and Antonie Olson: the Equiry was not commenced until a late hour on Wednesday night, and only terminated on Thursday morning at two o’clock. Before giving the evidence I may mention that the shaft at which the unfortunate men lost their lives is an underlay one, about 140 feet deep. For the first 60 feet the shaft is almost perpendicular, and at the side of the shaft spreaders are fixed about three feet apart; the spreaders serve as a kind of ladder way; from 60 feet, and a farther depth of 80 feet, the shaft underlays. Two wind lasses are used, one on the surface, and the other at the 60 feet level, one exactly over the other. The contract party consisted of six men, and they worked two in each shift. It is evident, judging from the position of the bodies when discovered, that the poor follows were endeavouring to ascend ; one man (Antonie Olson) must have fallen – it is impossible to say from what height. Brave men are always at hand in cases of this kind, ready and willing to risk their lives in endeavouring to save the lives of others. There was no lack of volunteers willing to encounter foul air and the fumes of charcoal in the hopes of rescuing men, who, by industry and good conduct, had gained for themselves the good will of many, and the respect of all who were acquainted with them. Messrs Smith, Allen, and McRea, particularly the latter, are deserving of special praise. At the magisterial inquiry, Alexander Lambert was the first witness examined. He stated : I am a miner, and went to work at the True Blue claim about 8 o’clock on the morning of Tuesday last. I lowered my mate down the shaft. Five minutes after he called to me, and said his light would not burn. I at once pulled him up. At 1 o’clock in the afternoon – of the same day I went below, and was obliged to come up at once, as my candle would not burn. Myself and mate then procured a nail-can, in which we placed chips and bark, set fire to them, and lowered the fire down the shaft from the 60 feet level. The smoke became so oppressive that we were obliged to go to the surface, where we remained until the deceased came to relieve us. I helped to lower deceased down the shaft. Called out, and asked if it was all right down below, and received for answer, yes. I then made the rope fast in the usual way. Never saw the man alive after. Remained at the shaft fifteen minutes, and then left. Am seventeen years a miner. Have often worked in bad air, and frequently tried the plan of burning chips with good effect. Lowered the deceased to the 60ft. level. Peter Rasmusan : The evidence of this witness was a mere corroboration of the evidence given by Lambert. S. Smith, mining manager of the True Blue Company, said : About half- past seven o’clock in the evening of the 4th instant a man named Goldsworthy came to me, and asked if the men were working at the air shaft. I told him they had started to work, but thought on account of bad air they had knocked off. Goldsworthy said he had called down the shaft, and could get no answer. I then proceeded to the shaft, and was lowered down about 40ft. The smoke was very strong. I saw the body of Lewis Schinkle close by my side. I could not remain longer, the smoke was so strong. The position of the body was – hanging by one foot, head downwards. I then called to be pulled up. Allen,said: I was lowered down the shaft and saw the body of a man hanging down the shaft. His foot was caught in a piece of timber near the side of the shaft. I then procured a lashing, which I made fast round the man’s leg. In that way he was drawn up. I assisted to land him on the surface. I have since seen the body; it is that of Louis Schinkle. Dr. E. W. Plews stated that he was called upon on the 4th instant to view the body of Louis Schinkle, and that death was caused by suffocation. Charles Gray Macken, examined: I was lowered down the True Blue shaft on Tuesday evening, 4th instant. Got down to the 60 foot level, and was obliged to be pulled up again. I could not stand the bad air. Water was then thrown down the shaft, and I was again lowered down. As I could not discover Antonio Olson, I called for assistance, that I might be lowered down to the other level. Two men came to my assistance. I was then lowered down about 25 feet, when I discovered the body of Antonio Olson. It was in a lying position, on the left side, and was jammed between the skids and the sides of the shaft. I then lashed the body to the rope, and was drawn up with it. Dr. Plews evidence was the same in this as in the other case. Mr Baber gave an order for internment. The remains of both men were removed this morning at six o’clock for burial at Stieglitz. Digger records have Antonio Olson death in 1870 age 23 years, parents names unknown. Birth place – Copenhagen. Digger records have Louis Shnkel (sp) death in 1870 age 20 years, father Richard Shnkel and mother Anna Bentina Birth place – Copenhagen. Both Lewis Schinkle and Antonie Olson’s bodies were conveyed to Stiegilitz where they were buried in the Stiegilitz cemetery. 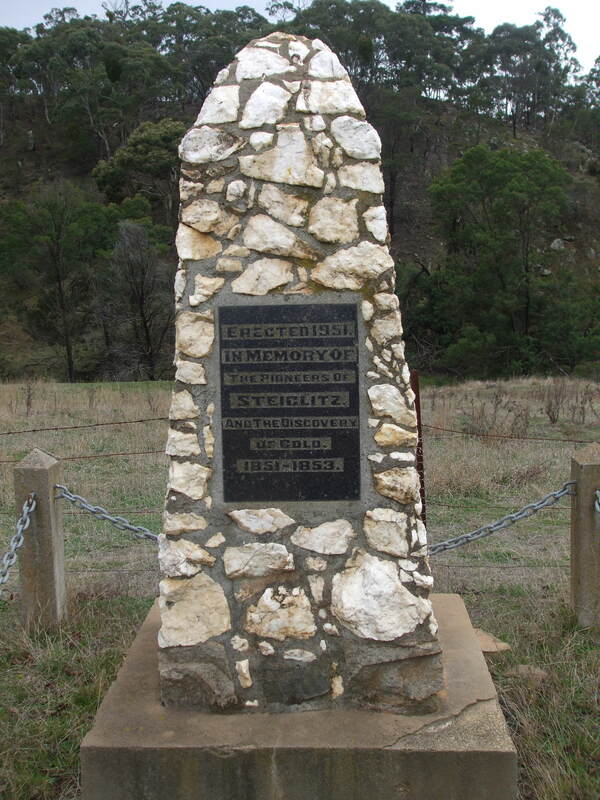 Photo of a memorial cairn erected in the Steiglitz cemetery in memory of the pioneers of Steiglitz. 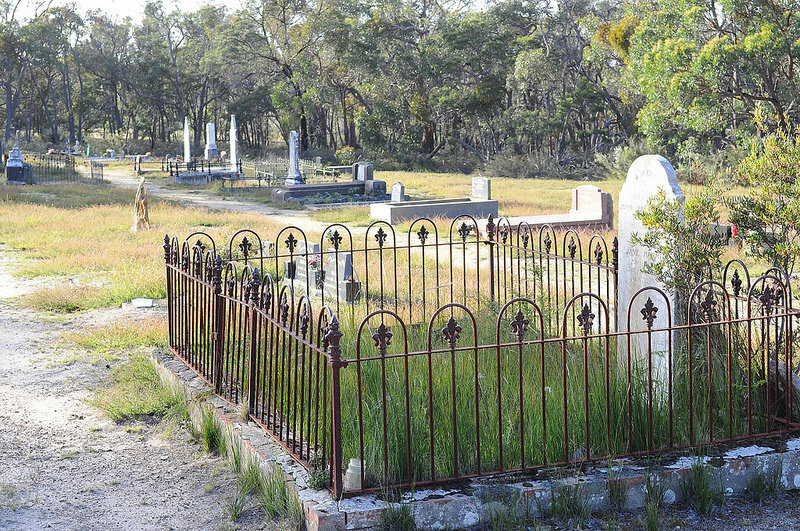 OLSON, Antonio 06/01/1870, age 23, parents unknown, not married, Killed in a mining accident at Barrys Reef, Blackwood. SCHINKEL, Louis 08/01/1870 age 20, parents – Richard & Anna Katerina (Bentina) not married, killed in a mining accident at Barrys Reef, Blackwood. Photo of some graves in the Steiglitz cemetery. Another find in a local newspaper gives a bit more personal history into the deaths of the two men. For help with information on Blackwood ancestors contact Margot Hitchcock.